EDITORIAL: 'ACCOUNTABILITY' TIME? When does Chicago hold its pundits and plutocratic party line preachers accountable for the simplest facts?... How is a 'strike authorization' different from a strike? So once again, the Tribune's editors and the Sun-Times owners get an "F" on school news. No teacher in Chicago is surprised, since teacher bashing and union busting has been the official version of reality as "news" in Chicago for so long that this latest is just more of the same. 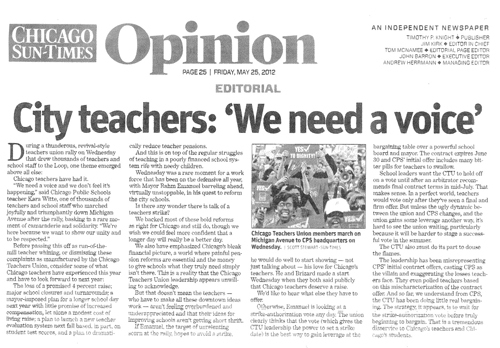 Contrary to the Alice in Wonderland version of history and reality pushed by the editorial board of the Chicago Tribune (above, the May 24, 2012 Tribune editorial), Chicago teachers have been aware for a year of the necessity of a strike. The first demand for a strike came when the newly appointed Board of Education lied and claimed it was facing a "fiscal emergency" on June 15, 2011 and voted to break the fifth year of a five-year contract with the CTU and the other unions representing CPS workers. From that day forward, the Tribune was part of a conspiracy of lies that ignored the lies and reckless misspending by the CPS administrations appointed by Rahm Emanuel, the evidence that was proving, month after month, that there had been no "fiscal emergency" as the next fiscal year at CPS (which began July 1, 2011) loomed. When the lies are in the news columns regularly, the punditries in the editorial columns (above) become even less moored to reality. In the above editorial, the Chicago Tribune ignores 25,000 Chicago teachers and finds one "teacher" (a millionaire heiress who now heads one of the city's many Astro Turf "school reform" groups) to hector the teachers about what they should do after a year of attacks. Left out of the Tribune's version of reality about this particular "teacher" (Robin Steans of Advance Illinois) is the fact that Steans was one of the main ruling class architects of the law that requires Chicago teachers — alone in Illinois — to achieve a 75 percent vote of the membership to authorize a strike. The lurid history of Robin Steans and the editorialists of the Chicago Tribune will be coming more and more into focus in the months ahead, as Chicago recovers from the reign of Rahm and lies and continues the lesson plans of the city's teachers and the Chicago Teachers Union.On the mornings following the largest teacher meeting in 32 years and the biggest Chicago Teachers Union march and rally in history, the city's pundits remained deliberately confused, and strenuously committed to continuing the confusion of their millions of readers. And so we see them as on a continuation of their campaign to try and continue to confuse their readers, listeners, and viewers about the city's public schools and public school teachers. Basically, now that it's clear the the 25,000 members of the Chicago Teachers Union will get the 75 percent vote necessary to authorize a strike, the pundits and their pals are parading around a new bit of disinformation, demanding that the strike authorization be postponed until "all the facts are in." Let's parse this latest brush with dishonesty and Orwellian sophistry piece by piece and fact by fact in the context of history. We must do this despite the fact that the facts are supposed to be where a newspaper begins its punditry. Why? Because Chicago's "news" since the inauguration of Rahm Emanuel has been epic in its dishonest toeing the plutocratic party line in teacher bashing, in union busting, and in the promotion of destructive privatization of public services and public assets. Note, dear and gentle reader, that we're not just talking about the editorialists and the pundits, who are supposed to be opinionating. In Chicago, it's the news that is the primary and original source of the pollution the plutocracy puts into the factstreams of daily political life. Facts are supposed to be the first portion of what passes for news. Not in Chicago, and certainly not when corporate "school reform" is on the agenda for the 20th year in a row. The Chicago Sun-Times editorial of May 25, 2012 plays the same dishonest tune as the Tribune's, but without the drollery of quoting a millionaire former "teacher" as a source for reality. Despite the differences in ownership, both the Sun-Times and the Tribune end up at the same place: CTU leaders are misleading the members; the "fact finding" will bring out the truth, etc., etc., etc. And therefore a strike vote should not be held now.On May 24, 2012 (Tribune) and May 25, 2012 (Sun-Times) the editorialists at the city's main sources of news and reporting again distorted the facts. 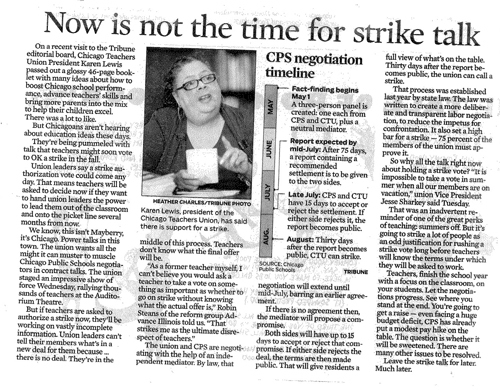 In both papers (a bit more risibly in the Tribune which searched the entire city to quote a "teacher" who isn't really a teacher, as we noted earlier in a Subscript), the claim is made that teachers shouldn't authorize a strike (by taking a strike authorization vote) until after the latest hoop in the long line of legal obstacles to Chicago teachers has been jumped through. But the active duty members of the Chicago Teachers Union won't be voting to go on strike in the next three weeks. They will be voting to authorize a strike if, in the opinion of their leadership, the prospects for a just contract are lacking and a strike will be the only way the teachers can finally stand up with power to challenge the lies and slanders that have been the currency of the administration of Mayor Rahm Emanuel and his supporters since he launched his teacher bashing offensive against the unions — especially the Chicago Teachers Union — on year ago. And let's remind the readers of the papers that that year began on June 15, 2011, with the breaking of a valid contract based on the first of dozens of lies told by the administration of his hand picked Chief Executive Officer, Jean Claude Brizard, and his hand-picked seven-member school board. For some reason, the economic fundamentalists who write for the Tribune and Sun-Times missed the simplest two facts. One, the very first action of Rahm Emanuel's seven-member Board of Education was to deliberately break a valid contract, legally entered, against more than 30,000 union members working for CPS. Two, the claim for the breaking of that contract (a "fiscal emergency") was a lie when it was first told (by an FNG "Chief Administrative Officer" who had been on the job less than a month) and a lie that could have been challenged any month as the Board of Education then moved to spend the money it said it didn't have in June on hair-brained projects — all favored by the mayor — for the next year. We don't know what would have happened had our brothers and sisters in the trade reported those twin facts in June, but the founding fact of Rahm's Board was that he lied, the Board lied, and the corporate media in Chicago let them all get away with that lie, stealing from more than 30,000 people who saw their contract ripped to shreds. Think about that when you wonder why the members of the Chicago Teachers Union won't be agreeing to any long-term contracts soon; the boss's word is no good. It became that clear and that simple from the first day Rahm Emanuel took control of the city's public schools, and its been so every day since. As a result of a teacher-bashing and union busting set-up in Springfield — cheered on by the Chicago Tribune and Chicago Sun-Times and their hand-picked education experts — the Illinois General Assembly again in 2011 passed a law that viciously discriminated against Chicago teachers and unions in the name of "school reform." That law, among other things, required that for the Chicago Teachers Union to strike, 75 percent of its members had to vote in favor of a strike. So much for democracy. As the world later learned, when the well financed corporate reform spokesman Jonah Edelman let the cat out of the bag in an egomaniacal posturing at the Aspen Institute, the "research" done by the media's favorites corporate reformers and their Astro Turf grouplets demonstrated that the Chicago Teachers Union had "never" gotten a 75 percent strike vote. Edelman outed his own lies when a video of his bragging was released on the Internet. At that point, even the politicians who had taken Stand for Children's dollars (a great deal of which had been raised by Penny Pritzker against the CTU in the waning weeks of 2010, after which such large donations became illegal) began backing off the official narratives of corporate "school reform." But the lies continued, if not from Stand for Children and Advance Illinois (which are still in action) then from elsewhere. In August and September, Substance blew the whistle on how Rahm Emanuel and the "Office of Faith Based Initiatives" at CPS were subsidizing preachers to protest against the union and on behalf of Rahm's "Longer School Day" proposal. While the preachers and the paid protesters marched outside City Hall in September (carrying signs that many couldn't read and unable to explain why they were there), the Sun-Times and Tribune ignored the facts and went ahead with the lies. When Rahm discovered that the "fiscal emergency" that had broken contracts wasn't really tooooo bad and announced that the heroic teachers who agreed with his Longer School Day notion would get lots more money (and their schools more money still), again only Substance was reporting the facts, which were there for every reporter in town to see. By the first day of school, which Rahm staged as a publicity stun at one of the sad 13 schools that accepted his bribes, the lies became more clearer still. One of the sad moments at the "STEM" elementary school on opening day was that the children had been given balloons for the first day of school — but they were forced to let their precious balloons go on command as part of that little bit of Rahm's brand of Hollywood hype. And so it went, on and on, throughout the school year. Rahm Emanuel spent more time hyping the city's charter schools than he would dare spend at any of the city's real public schools. His Board of Education added insult to injury by hiring a "team" of administrators all of whom came from outside Chicago, without education experience or certification in Illinois, and many paid signing bonuses and "relocation" fees — from a city that supposedly had a "fiscal emergency." We could go on and on, but the facts today are as simple as they've been since June 15, 2011, when the first Big Lie was gotten away with. Chicago teachers will be voting in a week or two or three to authorize a strike. Not to go on strike. A strike, if it has to begin, will begin on a date set by the CTU's 800-member House of Delegates. By then, every teacher and every delegate will have the information necessary to make that fateful decision. After a year of lies and insults, we don't believe that the Tribune or Sun-Times is going to go back over every lies and check out every fact since June 15, 2011, when they repeated Rahm's first round of lies with a straight reportorial face. Accountability in Chicago is only for teachers and the working class. Rich millionaires like Rahm and those who subsidize his lies with propaganda can get away with anything and never even have to hear the word "accountability" unless they are using it to spear teachers and unions with another one of their Hollywood scripts. Following the publication of the Tribune sermon, a number of irate teachers and union officials contacts Substance angry at the hypocrisy of Robin Steans, Stand for Children, the Civic Committee and the entire corporate "school reform" crowd active in Chicago and Illinois. Critics of the Astro Turf groups pointed out that the groups (along with the editors of the Tribune and Sun-Times) have devoted nearly 20 years supporting mayoral control and the corporate model for school reform. This has included the failed "small schools..." activities promoted by the Gates Foundation, the failed "turnaround" attempts, and the generally failed Chicago charter schools. Additionally, the corporate reformers have a touching faith in the good will of CPS management. Since 1995, the corporate reformers have supported the ban on the contractual enforcement of class size and the other major contractual issues which all other school districts in Illinois deal with through collective bargaining with their unions. Despite the claims that they support the needs of children, Stand for Children, Advance Illinois, the Civic Committee, and most recently, Illinois Democrats for Education Reform have all taken a completely corporate and management side in every issue facing the union and real teachers. While the corporate reform groups and their groupies like Robin Steans have never found a corporate gimmick they didn't love, they completely ignore the fact that the massive mismanagement of the Chicago schools has gotten worse and worse during recent years. Following the departure of Arne Duncan, who became U.S. Secretary of Education in January 2009, Chicago has had three "Chief Executive Officers: — ex-cop Ron Huberman (who came to CPS from the Chicago Transit Authority), charity chieftan Terry Mazany (who came to CPS for a brief time from the Chicago Community Trust), and now Jean-Claude Brizard (who arrived from Rochester New York a year ago following his appointment by Rahm Emanuel). While Steans and her corporate reform colleagues are speaking out in public against the teachers and their union, they are ignoring the growing examples of dangerous mismanagement and outright lies that come regularly from CPS management. The current claim by CPS financial managers is an example. While the corporate reformers simply repeat the mantra that CPS faces a "deficit" of $700 million, the corporate reformers ignore the purge of the remaining finance professionals within the CPS management — and their replacement by MBAs with no school experience, almost all of whom have been provided to Chicago after being vetted by the Broad Foundation and other corporate funders.